Global brands are an essential feature of any travel hub. These familiar names offer reassurance and a guarantee of quality to the international traveller. Over many decades, we have partnered with some of the world’s biggest names. These companies trust us to serve their customers to standards that are equally as good, if not higher, than those on the high-street. 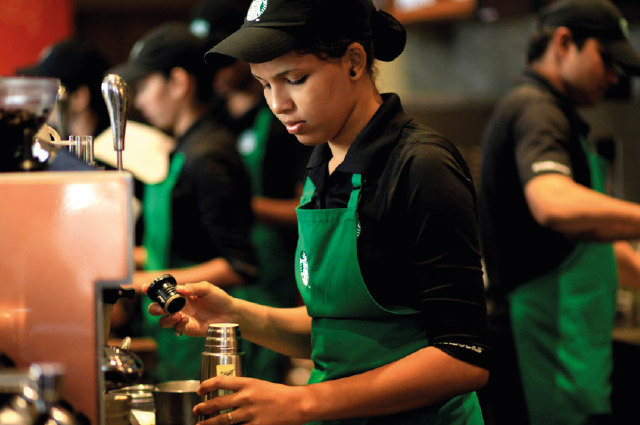 Starbucks is the largest coffee shop brand in the world with nearly 28,000 outlets in 76 countries. The atmosphere and ambience of Starbucks’ coffee shops is designed to be cosy and intimate. The combination of sofas, armchairs and coffee tables, bar stools and meeting room tables means that a variety of different customer needs are met at each coffee shop. All of the espresso served at Starbucks shops is sourced under the Starbucks ‘Shared Planet’ programme and is 100% Fairtrade certified. We began our relationship with Starbucks in June 2008 with an agreement to open Starbucks stores in prime locations across key European markets. Today we operate around 100 stores in the UK, Spain, France, Germany, and Switzerland, with outlets at both railway stations and airports. In 2009, we introduced the brand to the Swedish market when the country’s first Starbucks opened at Arlanda, and in 2012 we introduced the brand to Norway and Finland. 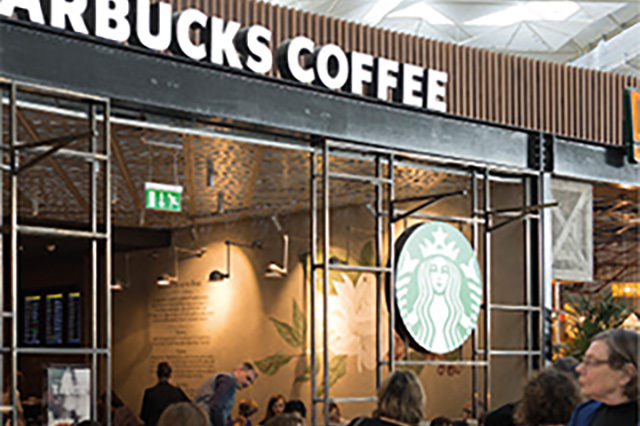 Most recently, in 2017, we launched Athens International Airport’s first Starbucks outlet. Founded in 1954, Burger King is the second largest fast-food hamburger chain in the world. Today the concept extends to more than 12,000 restaurants in 73 countries world-wide. 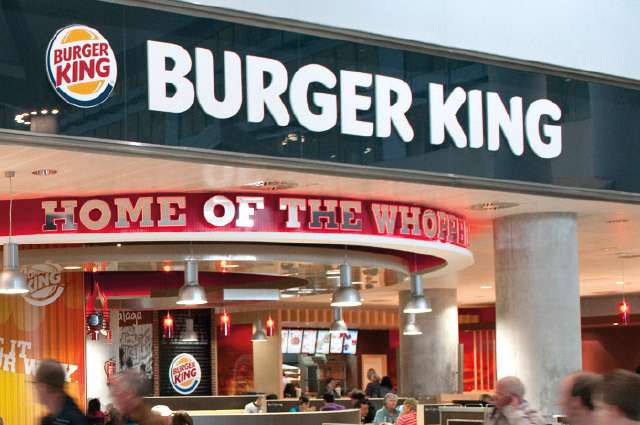 SSP operates Burger King in the UK, Spain, China, Cyprus, Egypt, Hungary, Germany, Hong Kong, Ireland, Sweden, Switzerland, Thailand and the United Arab Emirates, in both air and rail travel locations. In total SSP’s estate extends to over 100 outlets, serving over half a million customers every week. Among the latest openings is a new outlet at Haikou Meilan international Airport, Hainan, which is the brand’s first on the Chinese island. YO! Sushi offers the diner a moving feast of Japanese dishes, colourfully displayed on a classic Kaiten conveyor belt. Within seconds of sitting down, guests can help themselves to plates of sushi, sashimi, salads, hot Japanese classics and desserts. Plates are colour-coded according to price and empties are simply counted at the end of the meal to calculate payment. Few brands can move seamlessly from the high street to the travel sector, but YO! Sushi is ideal for the busy airport. Customers can easily see and understand the offer, and have a large degree of control of the time they spend at the restaurant. SSP’s first YO! 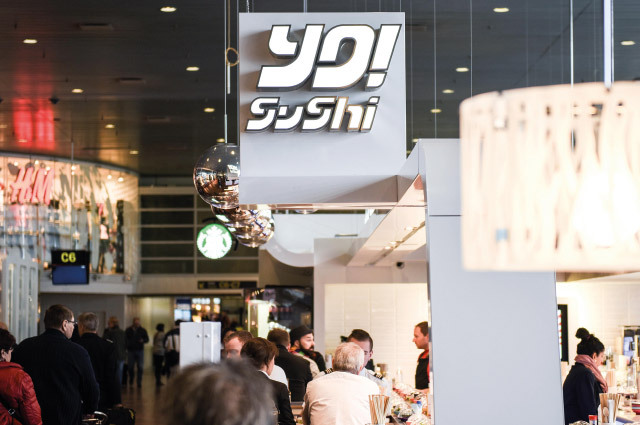 Sushi opened at Oslo Airport in 2012, which was the first location for the brand in the Nordics. Just months after its opening, the restaurant was named Best Self Service/Assisted Service restaurant at the Moodie FAB awards. Its success has led to more recent openings, including Oslo Central Station and Copenhagen Airport.